New project finds that building the world’s fastest-growing economy risks public safety and tests global resource limits. An expensive program to expand irrigation networks is occurring in Inner Mongolia, Jilin, and Liaoning provinces, which has prompted concern because it would push new irrigation canals into highly erodible grassland regions. These provinces have some of the worst desertification in the world. Click image to enlarge gallery. YOU YI, Heilongjiang Province, China — Where the wide, muddy waters of the Songhua River flow north from Jiamusu to the Russian border, just 150 kilometers (90 miles) distant, the whole of China’s largest treeless prairie sweeps to the horizon. This expanse of fertile grasslands endures the dark fright of cold Siberian winters and the raging winds of Mongolian summers. At night, in the scattered villages, the sky fills with stars so thick and bright that walking along unlit streets is easy. As late as the 1950s, the Chinese still aptly referred to this region as the Great Northern Wilderness. Virtually every hectare of arable land in other provinces was spoken for and cultivated more than a century ago, but Heilongjiang Province remained a place apart. Here, in China’s far northeast corner, the sun’s straight rays baked unplowed ground never shaded by homes or villages. In the wildest reaches eagles outnumbered people. A US$ 6.3 billion program to modernize and expand irrigation networks in northeastern China is expected to help the nation to keep pace with its rising demand for grain. A new canal, finished earlier this year, irrigates rice paddies in Heilongjiang Province. Click image to enlarge gallery. Two industrial sectors — agriculture and energy — make up 85 percent of the China’s freshwater use. In 2010, the latest year for accurate figures, China used 599 billion cubic meters (158 trillion gallons) of water. China’s coal sector that year used 120 billion cubic meters (31.7 trillion gallons), or 20 percent of the nation’s total. By 2020, according to government estimates, the coal sector will use 188 billion cubic meters (49.7 trillion gallons), making up 28 percent of the nation’s total water use. Meanwhile, agricultural water use — 371 billion cubic meters (98 trillion gallons) in 2010, or 62 percent of total national use — is expected to drop to 360 billion cubic meters (95.1 trillion gallons) by 2020, or 54 percent of the 670 billion cubic meters (177 trillion gallons) that China is expected to use that year. Water shortages in the dry Yellow River Basin — where 20 percent of the nation’s grain is produced — make it impractical, if not impossible, to produce substantially more grain in the region. Shortages of arable land in China’s wet south, where virtually every square meter of crop land is spoken for and droughts are increasing in severity, make it just as unlikely that China can raise much more grain in its subtropical growing regions. China’s northeastern prairie provinces, however, are seen by the country’s agricultural planners as having land and water resources in sufficient abundance to support China’s increasing demand for grain for at least the next decade and likely a decade after that. Providing water to irrigated cropland is the central strategy for growing more grain in Heilongjiang, Liaoning, Jilin, and eastern Inner Mongolia. Circle of Blue spent two days touring China’s largest farm, a state-owned and managed enterprise in eastern Heilongjiang Province that spans 110,000 hectares (272,000 acres), employs 120,000 people, and is a showcase of water-conserving farm technologies, many developed with the help of Israeli irrigation experts. The You Yi farm, modern and productive, and the centerpiece of a network of 114 state-owned farms, is evidence that China should be able to easily meet its need for more grain over the next decade. Heilongjiang (pronounced hay long gee-ang) is no longer that place. By the 1980s, as China’s population rushed past 1 billion, this expanse of virgin prairie — roughly the size of Syria — had been zipped open, plowed under, irrigated, and sown with seeds for rice and corn, soybeans and sugar beets. By the 1990s, Heilongjiang had climbed to the top of the list of China’s most important grain producers, filling rice bowls and satisfying the growing nation’s appetite for pork, chicken, and beef. In the first decades of the 21st century, irrigation networks are steadily expanding to allow for more cultivation and higher production. Revenue from big grain harvests, and from coal and hard-rock mineral mining, power the construction of glass-and-steel towers that now define the skylines of Heilongjiang’s cities, particularly Harbin, the swarming capital of nearly 11 million residents. Freeways tie the province’s cities together. Airports, several designed by internationally acclaimed architects, and white-and-blue high-speed trains as clean as polished mirrors link Heilongjiang to the rest of the country. Even in the places still so distant that the rare expanses of prairie have not been broken, cell phone service is five bars strong. Heilongjiang, in other words, is the expanding China that generates genuine enthusiasm among its own citizens and can intimidate foreigners who are not sure that their nations can compete. It is the China that invites the disdain of U.S. candidates during campaign season. But like an unstoppable wild fire, China also has become the world’s undeniable animating force in the international economy and the global environment. In effect, even as it grows bolder and wealthier, China also is producing extraordinary stress on its air quality, water supply, land, public health, as well as its long-term economic strength. But, unlike Las Vegas, we found that what happens in China with the soaring economic demand and deluge of wastes does not stay in China. In 2010, the latest year for accurate figures, China accounted for 9.5 percent of global GDP. In order to fuel the economic engine — now the world’s second largest, behind the United States — China consumed 20 percent of the world’s energy, 51 percent of the iron ore, 47 percent of the steel, 54 percent of the cement, and 60 percent of global soybean exports. 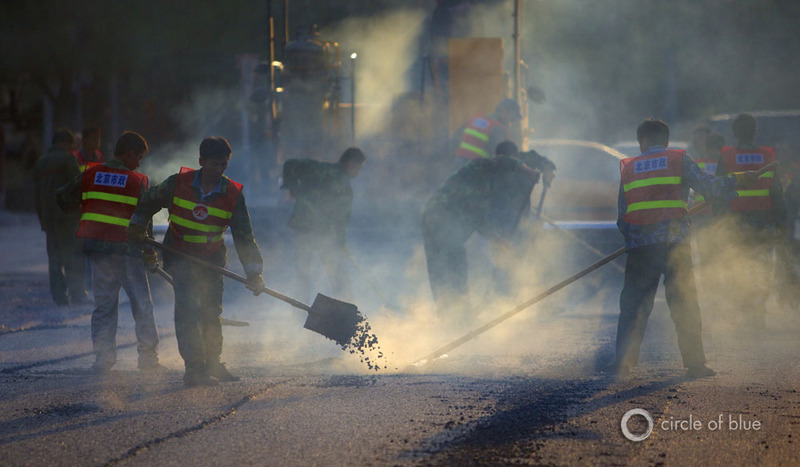 China now leads the world in expensive crash programs to bolster the economy and modernize patterns of civilization, including road construction in Beijing and other big cities. Click image to enlarge gallery. The Earth groans in response. China is now the world’s largest source of carbon emissions, sulfur dioxide emissions, and marine coastal pollution. China’s surging demand for fossil fuels is raising global prices for oil, gas, and coal, which, in turn, is helping to finance new water-intensive oil drilling in the deep shales beneath the American Great Plains; land-damaging tar sands oil development in Canada; and water- and land-wasting coal mining and natural gas production in Australia. China’s treasury and state-owned food companies are investing in a global land rush, buying millions of hectares of temperate farmlands in Africa and South America. Its state-owned power and construction companies are building the biggest hydro-electric dams in the world. The world is witnessing a run on resources that, arguably, is unmatched by any country, ever. And while China’s 12th and latest five-year plan focuses on water conservation and environmental protection as national priorities, the reality is that Chinese culture — which prizes privacy, rebels against specific directives, and is devoted to GDP growth — impedes the work to secure natural resources. Though authorities in Heilongjiang and elsewhere in China told us that the central, provincial, and municipal governments have begun to address environmental safety in earnest — and to some extent they have — we also found that the result of China’s unquenchable thirst for growth is tantamount to a water-wasting, resource-depleting, pollution free-for-all. 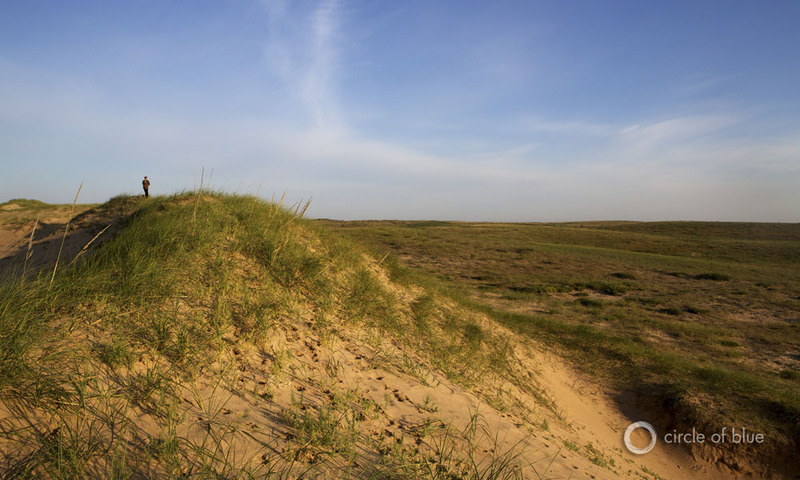 An incandescent sea of grass covers much of central and eastern Inner Mongolia. A plan to irrigate grasslands along the border with Jilin and Liaoning Provinces has raised alarms because almost every previous project to turn grasslands to farmland has resulted in extensive erosion that turned the ground to dust. Click image to enlarge gallery. In May and June, Heilongjiang Province was on the itinerary of eight provinces across northern, central, and southwestern China that were visited by Circle of Blue researchers for our newest project, Choke Point: China II, a research and reporting initiative done in partnership with the Wilson Center’s China Environment Forum. Over the next several weeks, in infographics, photographs, and comprehensive articles, Circle of Blue describes the extraordinary measures that China is taking to shift the geography and production practices in its agriculture and energy sectors to provide adequate supplies of food, fossil fuels, and fresh water over the next decade. We also report on the troubling and globally significant results to water, land, and public safety. From the nation’s largest state-owned farm in Heilongjiang to a tiny growing cooperative in Gansu Province to the villages near China’s first deep shale natural gas wells in Sichuan Province, Circle of Blue researchers interviewed growers and shopkeepers, scientists and engineers, business leaders and government officials. Just as in our original 2011 Choke Point: China report, Circle of Blue’s researchers set out to gain a keener understanding of just how robust and risky China’s development really is. China does not just want to be a self-sufficient producer of energy. The nation is determined to expand its position as this century’s largest energy producer and consumer, and that goal now includes sharply increasing the domestic supply of natural gas. State-owned energy companies — with technical assistance from the United States government and partnerships with Western energy companies — are drilling exploratory wells into deep shale reserves in preparation for what the central government hopes will be a natural gas production boom similar to what is occurring in North Dakota, Texas, Pennsylvania, Ohio and almost a dozen other American states. The idea is to extract enough natural gas as a fuel for electricity generation and manufacturing to reduce the coal production that is stressing water supplies in China’s northern and western deserts and which is the source of the highest climate-changing emissions on Earth. Circle of Blue, however, found that China’s deep shale gas reserves are much more difficult to develop than those in the United States. Deep shale gas production is occurring very slowly in China, with just one or two new wells drilled a month in Sichuan Province, the primary production zone. In interviews with Circle of Blue, Chinese drilling engineers described a tangle of technical obstacles, including the presence of high concentrations of a deadly gas within the shale reserves; difficulty in tapping shales that are not as uniform as they are in North America; undeveloped pipeline and processing infrastructure; civic protests over land seizures for drilling pads; and centralized production and marketing that eliminates competition, which is severely slowing the industry’s growth. Confrontations between rural villagers and the oil industry are increasing in Sichuan Province as new wells replace farmland. 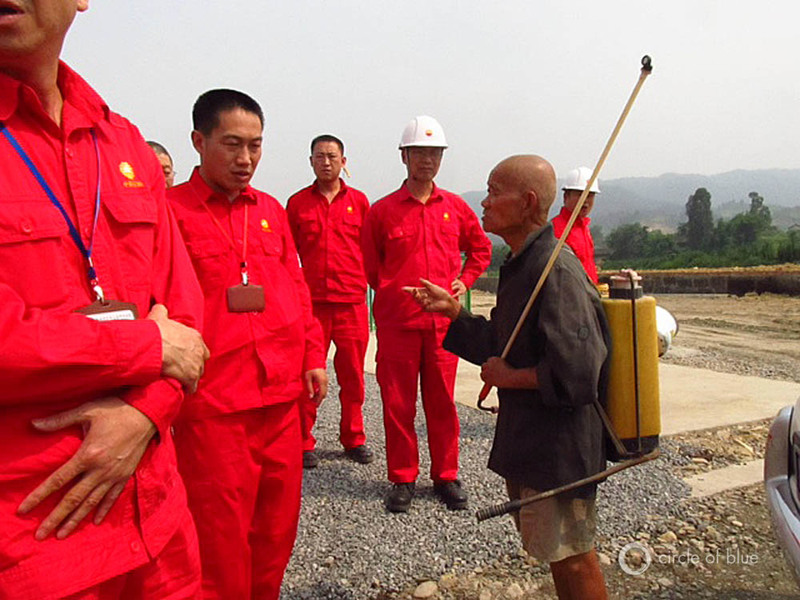 A fish and rice farmer, carrying an herbicide sprayer on his back, walked over from his rice paddy and confronted two PetroChina managers at the Wei-201H3 well. “What company are you from?” he demanded. “Since this well was put here, my fish have gotten some sort of sores on them. My land isn’t producing as much. I tried to call to report these conditions. Nobody will help.” Click image to enlarge gallery. Similarly, China does not just want to be a self-sufficient food producer. Now the largest grain grower in the world, China has experienced eight straight years of record harvests. But feeding 1.3 billion people — whose diets are favoring more grain-consuming chicken, pork, and beef — challenges the productivity of 120 million hectares (300 million acres) of arable land, roughly as much land that is farmed for crops in the United States. It also tests the capacity of an aging, leaky, and inefficient irrigation network. In 2012, the Chinese central government embarked on a $US 6.3 billion (RMB 38 billion) five-year program to modernize and expand irrigation systems in Heilongjiang and three other northeastern provinces. The renovation represents an investment designed to ensure farm supremacy in China’s prime grain-growing regions for at least a decade. By 2020, China anticipates the need to domestically harvest 595 million metric tons of grain — which is 48 million metric tons, or 8.7 percent, more than in 2010 — and Chinese farm authorities are counting on the northeast region to grow most of that increase. 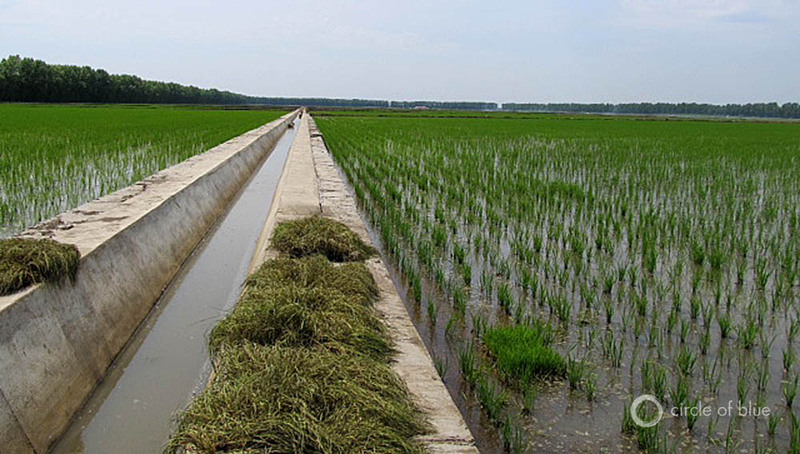 The expansion of irrigation networks in Inner Mongolia, Jilin, and Liaoning provinces have prompted concerns, however, because it would push new irrigation canals into highly erodible grassland regions. 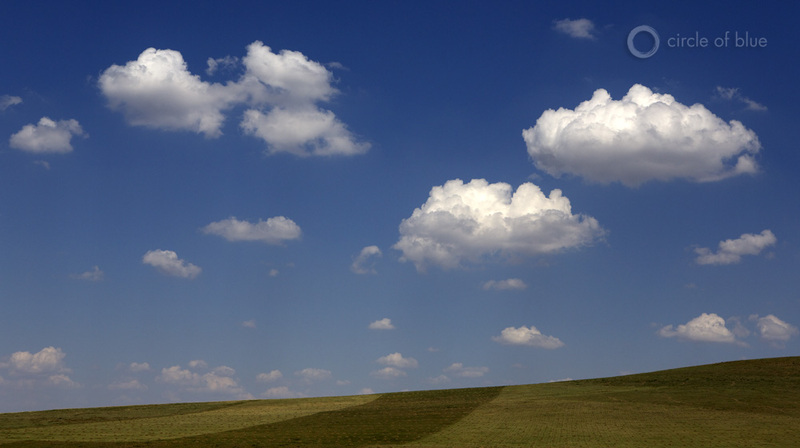 Circle of Blue learned that Chinese authorities are considering opening 30,000 hectares (nearly 75,000 acres) of grasslands to new crop production. But growing food in desert conditions on brittle grasslands could produce new areas of severe soil erosion, which already is endemic across much of northern China. China is building the world’s largest water transport project, to move fresh water from the wet south to the dry north. Still, water supplies will continue to be tight, especially in the nine provinces of the Yellow River Basin. Based on current rates of growth in grain harvests and coal production, and recognizing the trend in diminishing water supplies, by 2020, an additional 20 billion cubic meters of water will be needed than is available, representing one of the most urgent risks to China’s economy and environment. Click image to enlarge gallery. It is not only the quantity of water available to agriculture that is a rising issue in China but also the quality of water used by farmers. Circle of Blue found that a portion of China’s farmland is irrigated with toxic wastewater. Industrial and municipal wastewater that flows through China’s irrigation networks has polluted nearly 10 million of China’s 120 million hectares (25 million of 300 million acres) of cultivated land. Moreover, 133,000 hectares (328,000 acres) have been infiltrated or destroyed by solid wastes, according to official statistics. China’s Ministry of Land and Resources estimates that heavy-metal pollution destroys 10 million metric tons of grain and contaminates another 12 million metric tons annually, incurring billions of dollars in direct economic losses each year as China struggles to satisfy the more sophisticated diets of its growing population. In the fields surrounding Qingdao of coastal Shandong Province, cropland and orchards were irrigated for decades with industrial wastewater, including the wastes of the city’s metal-plating industry. Farm soil there contains high levels of heavy metals and other chemical contaminants, which are hazardous to human health. The city and university soil scientists are tackling the problem with a number of clean-up projects to reduce toxic concentrations, including planting fields of grasses and shrubs to soak up the contaminants. There are 670 kilometers between Beijing and Qingdao, a Pacific Coast city of glass towers, 10-lane boulevards, sandy beaches, and 8 million metropolitan residents. 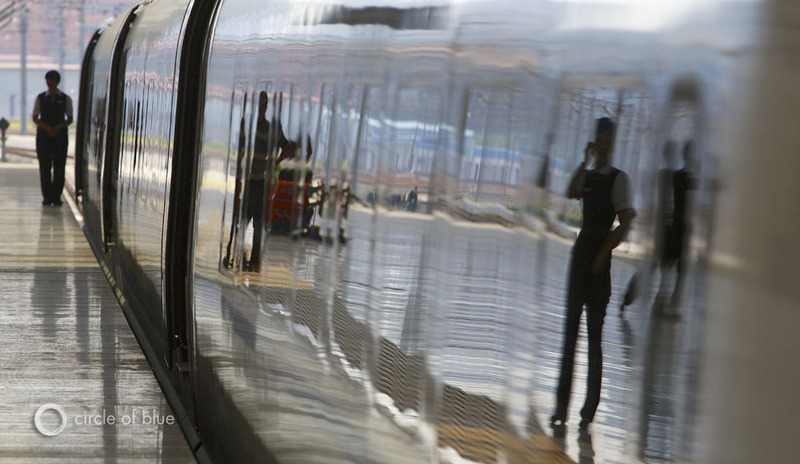 On China’s white-and-blue train line, part of a high-speed bullet train network soon to encompass 16,000 kilometers, the trip takes only four hours and 20 minutes. Click image to enlarge gallery. In an interview, Qian Yi, a professor and the dean of the School of Environment and Safety at Qingdao University of Science and Technology, explored the deepening conflict between China’s insistence on swift economic growth and its lengthening list of water, energy, and resource constraints. Qian paused, as so many Chinese academics and government officials do when asked why China does not pursue resource conservation and environmental safety with the same level of enthusiasm as has been displayed for so many other public programs. There is no argument that China operates on a scale and at a speed unmatched by any nation, ever. 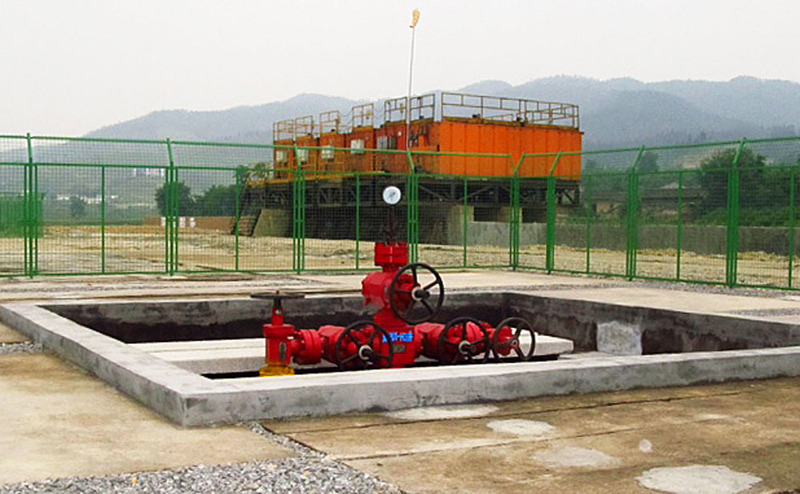 On October 2, 2011, PetroChina completed Wei-201H3, the first deep shale gas well in China to use horizontal drilling and fracking technology. It is located in a new natural gas development zone, northeast of Weiyuan in central Sichaun Province. Click image to enlarge gallery. The Chinese leadership does not just want to modernize its economy, improve the well-being of its growing population, and influence the world. It wants to make the 21st century its own, much like the United States commanded attention, respect, and power in the 20th century. But attaining that level of global ascendancy depends not only on potent national resolve, a cultural trait that China enjoys in abundance, it also hinges — in an era defined by rising climatic threats and increasing demand for food and energy — upon China’s ability to manage and solve the risky cycle of confrontation over natural resources, especially fresh water, that has emerged in every region of the country. Circle of Blue’s reporters have engaged this distinctive conversation — optimism mated to pessimism — previously in China. Produced with the help of the China Environment Forum of the Woodrow Wilson International Center for Scholars, our 2011 Choke Point: China report was among the first to thoroughly explore the dimensions and define the scope of the tightening resource choke points that could impede or even halt China’s global ascendancy. The region where these water-food-energy trends are most visible and urgent is the Yellow River Basin, in China’s dry north, which produces 70 percent of the nation’s coal and 20 percent of its grain, but where water supplies are so tight that the nine basin provinces have agreed to a system of rationing water from the river. Based on current rates of growth in grain harvests and coal production, and recognizing the trend in diminishing water supplies, Choke Point: China concluded that, by 2020, the Yellow River Basin would need 20 billion cubic meters of water more than would be available in the region at that time. In other words, without significant changes in production practices and patterns of water consumption, China faces grim shortages of food and fuel that could weaken or even wreck its new era of influence and prosperity. In April 2011, Circle of Blue and the China Environment Forum presented these and other conclusions in Beijing to leaders of the Institute of Water Resources and Hydropower Research, a think tank of China’s Ministry of Water Resources, the national government agency that oversees freshwater reserves. Dr. Yangwen Jia, a chief engineer of the Institute of Water Resources and Hydropower Research, attended the meeting and told us that China was busy trying to relieve some of the pressure on the Yellow River Basin’s water supply by shifting more grain production to Heilongjiang, Jilin, Liaoning, and eastern Inner Mongolia in northeastern China. The central government, he said, was preparing to announce a big infrastructure project to modernize and expand the region’s irrigation network. Based on what Dr. Jia told us, the Circle of Blue team promised to return to China to report on the new irrigation program. We also wanted to take a closer look at China’s work to diversify its energy supply: reducing pressure to mine more coal in the desert provinces of the Yellow River Basin by developing deep shale natural gas reserves in the water-rich south. In Harbin and Shenyang, two of the largest cities in northeast China, we were awakened by the sounds of incomparable enterprise, the clanging steel of new high-rise housing, and the honking horns of jammed boulevards that is the background music in every city. In Chengdu, in southwest China, and Qingdao, along the Pacific Coast, we spoke with ordinary Chinese men and women and all manner of academics and government officers, enormously proud of China’s progress, yet genuinely skeptical of its staying power. We took elevators to the summits of gleaming office towers and also walked by fetid rivers that China has been slow to repair. We dined on tastefully seasoned dishes and — after reporting from farms along the Yellow River — worried whether the vegetables had been irrigated with industrial wastewater. We rode in roomy new Buicks and Audis and breathed air so filthy with coal dust and oxides that the sidewalks were coated with a greasy black film. Here in Heilongjiang, where new concrete irrigation canals replace channels dug from mud 50 years ago, farmers delight in flooding rice paddies and spraying corn fields with water that does not have as much grit and dirt. But like so much of China’s development strategy, the big thought — driven by need and urgency — to expand irrigation networks to the erodible grasslands of neighboring Inner Mongolia, Jiliin, and Liaoning provinces does not prompt nearly as much consideration as the plainly visible consequences should require. Indeed, in considering what could be gained, and what seems certain to be lost in irrigating northeast China’s grasslands, the inescapable conclusion is this: The nation that now leads the world in expensive crash programs to bolster the economy and modernize patterns of civilization — immense high-rise housing developments in almost every city, new subways in more than 30 cities, a 16,000-kilometer (10,000-mile) high-speed rail network, a concentration of seawater-cooled nuclear plants, giant pipelines to transport water from the Yangtze River in the south to water-scarce cities in the north, expansive new irrigation systems to water thirsty farmland — has no similarly impassioned focus on clearing the skies, scrubbing the waters, and safeguarding the lands from the uncivil consequences. Much of China’s rice is raised in flooded paddies of a few mu (six mu equals one acre) that are tended by a single family, including this paddy in Heilongjiang Province. Click image to enlarge gallery. Hi Keith — Excellent story, per usual! Here in the US we keep hearing stories of multinational petrol companies licking their lips with excitement over the fracking prospects in China. Are these reports over stated, or do the petrol companies have a plan to overcome the obstacles you list for fracking in Sichuan and other locales? What may explain the conflicting reports emerging in the press? Christine, there is excitement globally about China’s shale prospects, as you know. What I found, at this early stage, is that the prospect of big natural gas production is running headlong into the reality of numerous impediments. Chinese authorities told me that the reserves are plentiful. They are turning out to be difficult to tap. The projections of a quick flood of shale gas into domestic markets are unreasonable to attain. It will take longer than five years, as Chinese government officers initially said earlier this year. China just isn’t drilling that many wells at this point. Excllent article thank you. I would however like to clarify that Shell is not a partner in the Wei-201H3 well. I look forward to further articles from your group.